The quick mounts make it easy to install the cutters on the cart. Efficient control of cutting depth facilitates adjustment and return to previous setting. Simple lateral adjustment enables cutting in straight or curved lines. 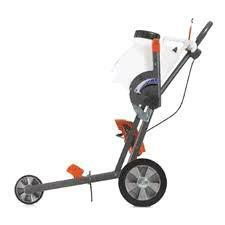 Wheels are laterally adjustable, and allow cutting close to walls and curbs. Easy to fold up and transport. * Please call us with any questions about our cart for rental 16 inch k970 cut off saw rentals serving Bensenville IL, Lombard, Des Plaines, and the Chicagoland Suburban Area.